When most people think about making a sewing machine cover, they think to sew it. But why not crochet it? Crochet a cover for your sewing machine to fuse together two different hobbies and crafts. Nothing says “it was crocheted” like the look of granny squares. 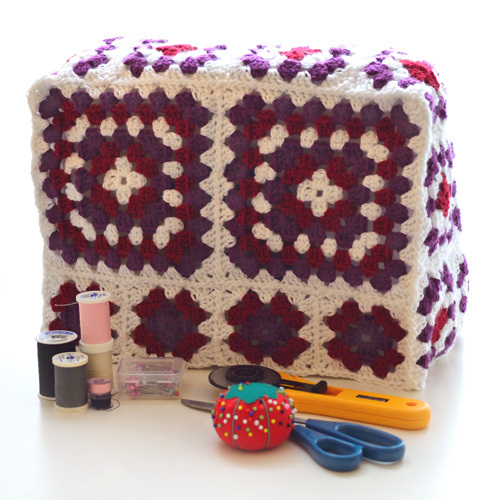 This sewing machine cover is created with small, medium, and large granny squares. The cover will fit over most hobby sewing machines, but feel free to add or subtract squares to make a custom fit if desired. This entry was posted on Monday, February 19th, 2018 at 12:00 AM by Rachel Choi	and is filed under Best Crochet Patterns. You can follow any responses to this entry through the RSS 2.0 feed. You can skip to the end and leave a response. Pinging is currently not allowed.